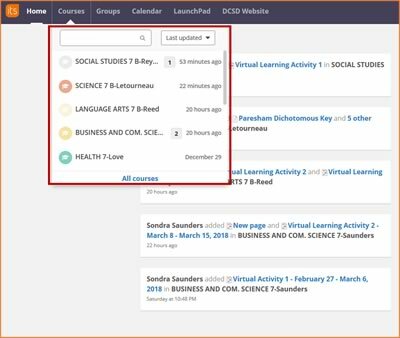 Student will access virtual learning assignments in VERGE for each class. Students can get to VERGE by logging into Launchpad. Teachers will provide paper copies of the assignments as needed (e.g. Pre-K and Kindergarten). Assignments will be provided for all courses. The assignments will be aligned to the standards that the students are currently learning. All assignments will be content-specific and relevant. Each assignment will be the equivalent of one class period. Assignments may involve reading, writing, conducting research, performing mini labs, completing practice problems, practicing skills, taking notes, answering questions, etc.. (e.g., email, VERGE Messenger, etc.). Teachers will grade each assignment and enter the grade into Infinite Campus for grades 1 through 12. Assignments will be named Virtual Learning Activity 1(VLA1) and Virtual Learning Activity 2 (VLA2) in the “Assessment During Learning” category (25%). 2. Scroll down to the bottom of the screen and click on the Launchpad icon. 3. Click Log in with Active Directory. 4. Type in your username and password in the Authentication Required box. Then, click the OK button. This is the same username and password that you use on school computers and Digital Dreamers 1 to 1 Devices. If you need further assistance, see your teacher for your username and password. 5. 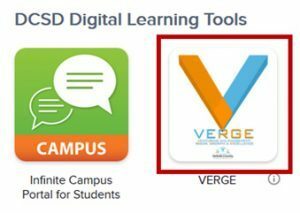 Locate and click on the VERGE icon located under the DCSD Digital Learning Tools in Launchpad. 6. 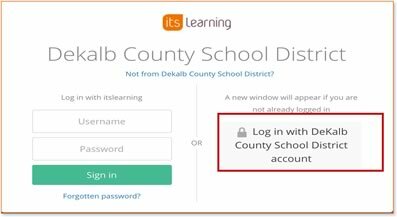 If requested, click Log in with DeKalb County School District account. 7. You should now see the VERGE Home Screen. 8. Click on Courses and then click on the desired course. There is a scroll bar to use if you do not see your course. For elementary and middle schools, A is the fall semester and B is for spring semester courses. High School students should check with their teacher on which course to select. 9. Once the student clicks on the course, they will see the Overview page. 10. Click on Resources. Then, click on the Virtual Digital Learning folder on the left or in the center. 11. Click on the Virtual Learning Activity 1 or 2 page. 12. Follow the directions on the Virtual Learning Page. If you have further questions, please see your teacher.